Robert Tarza is a very high level attorney working for the upscale firm of Marbury Marfan in Los Angeles. On page one Tarza walks into the building and there, in the lobby, finds his boss, Simon Rafer, dead, stabbed to death with an ornate dagger still in his back blood spreading around him. This is the first (I think) of three novels by Rosenberg featuring Robert Tarza. It was an impulse purchase based on the description and Audible sample. So obviously Tarza is a “person of interest” and the reporters gather, another attorney, the young, lovely and somewhat sassy Jennifer James, offers to help – actually she pushes her help on him. Seems Rafer had been a lover and Tarza had helped James in the firm. Everyone is suspicious – Tarza is not terribly likable at first and he may or may not be “reliable” – it’s a first person narration and he finds himself lying pretty quickly – but he really doesn’t like lying at all. The plot threads off into the subject of old coins and their use in drug money laundering – moderately interesting. 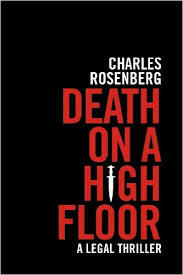 Death on a High Floor is well written, the characters are great and it’s hugely suspenseful. On the downside, it’s a bit too long. The narration is perfect. The cover bills it as a legal thriller, but sounds like it’s a murder mystery too. I always avoided legal thrillers because I thought I’d get bored with research and courtroom scenes. Then I read one by Michael Connelly which played into his Detective Bosch series and absolutely loved it. Even the courtrooms scenes which I found riveting. The “courtroom” part in Death on a High Tower is all preliminary hearing – no real trial – so that loosens everything up – it’s mostly a murder mystery with quite a lot of legal setting and some “thriller” (chase/danger) aspects, too.